You hope for all sorts of things for you toddler but superhuman speed probably isn't one of them. You can imagine what would happen if he could catch up with the fire truck he likes so much or creates a sonic boom whenever you said no to ice cream. So far your kid hasn't spent a lot of time in a lab during a thunderstorm so you probably don't have to worry about super powers anytime soon. We're guessing that your little tyke likes to think he's pretty darn fast, though. 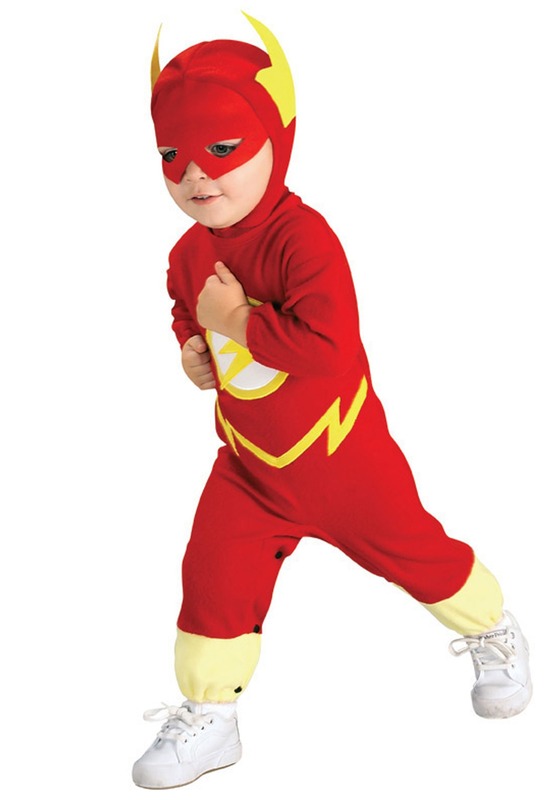 If your guy has a need for speed than he's going to love wearing this Flash costume. In this red romper and headpiece, your little guy will be zipping around the house with superhuman cuteness. He'll be ready to solve the cold case of who ate the last graham cracker. He'll shoot to the front door to tackle the babysitter and be off again before you can say "Diaper change". Sure, maybe you'll find all this running a little overwhelming, but you'll sure be happy when he comes home with an Olympic medal in a few years. The Flash has done a lot in his career as a superhero. Fighting villains all over the world, falling in love, starring in his own TV series and multiple movies. Your little guy will probably have a great career as a super guy too, for now, he can say, "I'm the Flash, fastest baby on earth."